A tender night-light shade is a beautiful addition to a nursery. It's easy to make by photocopying a design onto flexible vellum, then wrapping the vellum around a shade frame. Make one to match your baby's curtains, bedding, or wallpaper. Or feature a character from a favorite book or one of your baby's first works of art. Copy design onto an 8 1/2-by-11-inch sheet of lightweight, flexible vellum paper; we enlarged a fabric sample. Trace our template onto photocopied vellum; cut out. 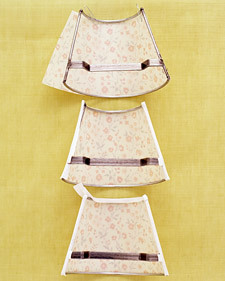 Apply craft glue to night-light shade frame, and lay paper in place (below, top); secure with paper clips until glue dries. Cover side edges of shade with bias tape, gluing in place with craft glue (below, center); repeat to cover top and bottom edges of shade (below, bottom).